Distance: 9 miles (14½Km) (there & back). Time: About 6 hours (there & back). Grade: 4 / 5 Hard Mountain Walk. Start/Finish: Far end of Victoria Terrace, Llanberis, off the A4086. 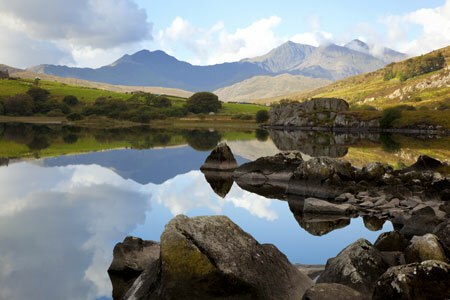 Llanberis Path is the longest and most gradual of the six main paths to the summit of Snowdon, and offers fantastic views of Cwm Brwynog, Llanberis and over the Menai straights towards Anglesey. This is the most popular path amongst leisurely walkers as it is thought to be the easiest to walk in mild weather, but in winter, the highest slopes of the path can become very dangerous. The path mainly follows the Snowdon Mountain Railway track, and goes by Hebron, Halfway and Clogwyn stations. Before the railway was opened in 1896, visitors employed guides to lead them to the summit along this path on mule-back. A remarkable geological feature can be seen from the Llanberis path, the Clogwyn Du’r Arddu syncline. The syncline was formed over thousands of years, as the earth moved and transformed horizontal deposits into vertical layers of rock. Then after this we will pop into Llanberis it self and have a fab Sunday lunch meal in the Heights and have a very rewarding pint before the drive home.